Doug McClellan has been contributing to Bicycle Retailer & Industry News almost from the magazine’s beginning. He had been a newspaper reporter for 20 years, covering stories from New Mexico to Bangkok, and has been involved in trade magazines for nearly 15 years. Doug now freelances from Santa Fe, New Mexico. BOULDER, Colo. (BRAIN) — Cycling advocates are casting a wary eye on bills pending in several statehouses that seek to legalize electric scooters. Their concerns aren't with e-scooters as such, but with the scooter industry's attempts to classify them as legally identical to bikes or electric bikes. LAS VEGAS (BRAIN) — Panasonic, an e-bike pioneer that has been on the sidelines of the mid-drive motor boom, is making a new bid for market relevance by announcing a partnership with Kent International. BROOKLYN, N.Y. (BRAIN) — Industry associations continue to lobby against the 25 percent tariffs imposed on Chinese-made electric bikes and motors. But many suppliers and retailers say most premium brands typically sold at IBDs are not affected, since these bikes don’t come from China. FRIEDRICHSHAFEN, Germany (BRAIN) — It was a hard-to-miss trend at Eurobike this year. Electric drive systems are now appearing on the holiest of holy bikes: the high-end performance road bike. Lighter, discrete drive units are tuned for sporty road use. "You just maybe use (the motor) for 20 minutes." LANSING, Mich. (BRAIN) – Michigan this week became the seventh state to adopt a three-tiered classification system for electric bikes. Gov. Rick Snyder on Tuesday signed a trio of bills, backed by e-bike manufacturers and cycling advocates, that also allows e-bikes on certain trails. PORTLAND, Ore. (BRAIN) — The Electric Bike Expo has canceled this weekend's consumer test fest in Portland because Monday's total solar eclipse, which makes landfall south of the city, has wreaked havoc on its logistics. SIMSBURY, Conn. — As it nears its 10th anniversary, Pedego Electric Bikes celebrates the opening of its 100th retail store, in Simsbury, Connecticut. 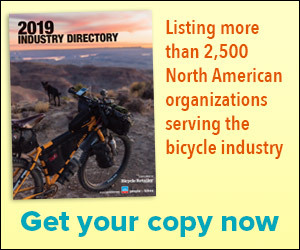 LINCOLNWOOD, Ill. (BRAIN) — BMW has joined the Electric Bike Expo as an exhibitor beginning with its Chicago-area event, which opened Friday and continues through Sunday. BMW will be on board for the other four stops on the 2017 Expo tour, which include Burnsville, Minnesota, in July; Portland, Oregon, in August; Miami in October and Philadelphia in November.